Today marks thirty years since the release of The Joshua Tree in stores. Vinyl was a fading format. Cassettes were at the forefront for many music fans. And compact discs were just starting to make an appearance in North America and Europe having found favour in Japan in the years prior. The Joshua Tree was released at such a time that there was even an 8-track version of the album pressed, although it was only available through record clubs. In the early days of U2’s career there wasn’t a lot of merchandise produced to support the tour and album releases. Buttons, t-shirts, tour programs. The Joshua Tree in 1987 wasn’t that different, but U2 was starting to reach a level of success which meant there was a demand for more product, and as singles started to soar in the charts, the demand only increased. This is not an attempt to give a complete run down of what was available then, or even now for The Joshua Tree merchandise. There was a second wave of interest in The Joshua Tree in 2007 when the album was re-released by Universal for its 20th anniversary, and Live Nation jumped in and made even more merchandise once they signed U2 to a contract in 2008. And there is a new wave of collectibles just around the corner with the launch of the new tour. With all of the items out there today, its impossible to cover them all within the scope of this article. But we’ll take a trip through some of our favorites. IMAGE: The Joshua Tree bolo tie. One of our favorite items from the original The Joshua Tree Tour was the leather bolo tie. The bolo tie is a piece of leather cord with metal decorative tips, secured with an clasp or a slide. In North America the tie is often associated with Western wear, and with the desert. 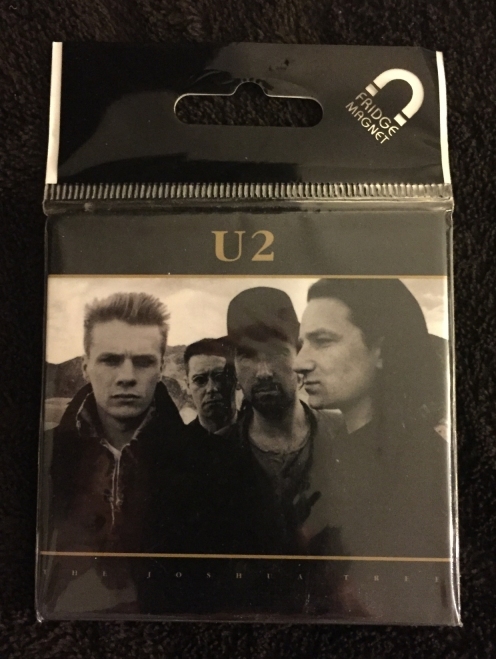 During The Joshua Tree Tour in 1987 one could buy an official U2 bolo tie from the merchandising stands. 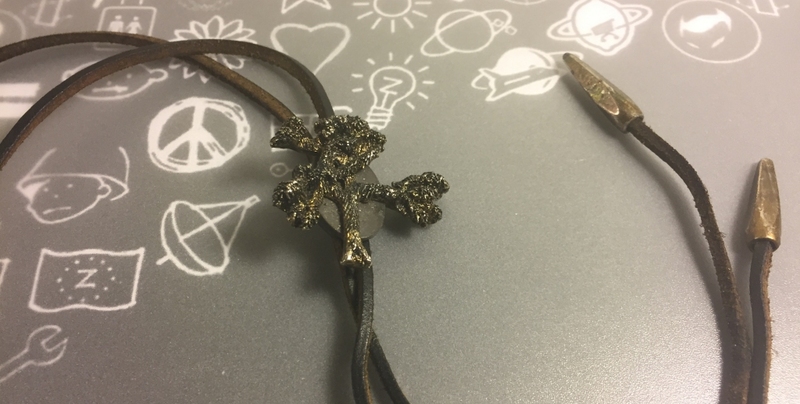 The tie was a simple strand of leather, with two decorated metal end pieces. The centre is a slide that allows the tie to be made loose or tight. On the slide is a metal replica of the original tree. The same mold that was used to produce the tie clasp was also used to produce a decorative pin held in place by two pin backs. The pin can be seen in the image below. 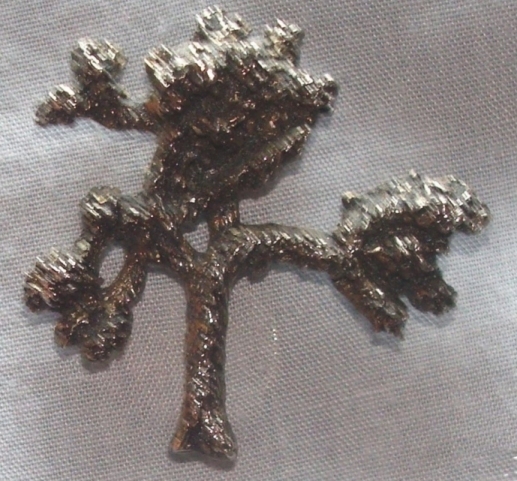 IMAGE: The Joshua Tree pin. Another item from the original tour in 1987 was the tour book. There were three known books produced for The Joshua Tree tour, one for each of the three legs. The first leg, North American tour book was a black cover with U2 featured on the cover near the top in the pose used for the cassette cover. Above the picture of the band was listed “The Joshua Tree U2”. The book design was changed for the second and third leg of the tour. Instead of a black cover, the tour book was now a beige/gold colour, and featured a large image of the actual Joshua tree used in album photography. One book covered the summer European dates and one covered the fall North American dates. The first and second leg books were 60 pages in length, and the final third leg book was 62 pages in length. They were sold at merchandising stands in a brown U2 envelope. The interior contents of the books were very similar, with the tour dates at the back being the easiest way to see a difference in the contents. 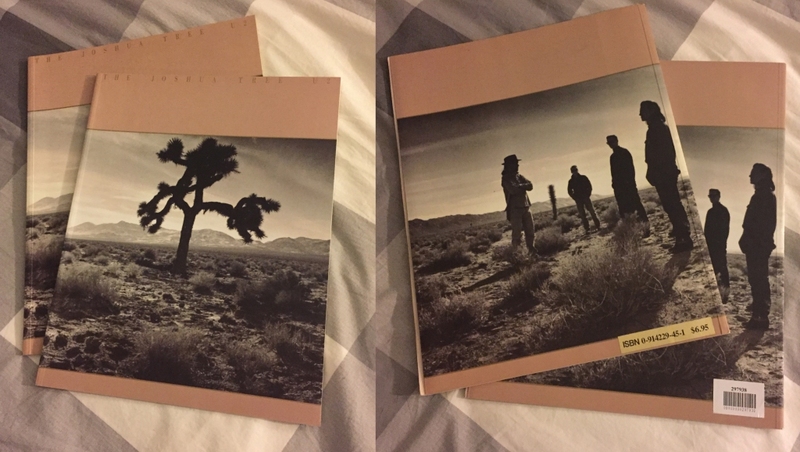 IMAGE: The Joshua Tree Tour book labeled for store sales. There must have been a large overprinting of the third leg North American book, and in 2005 a number of these started showing up in music stores throughout North America for sale. In these cases a UPC sticker or sometimes just a price and ISBN number were affixed to the back of the book to allow it to be sold. Above you can see an example of a couple of these third leg tour books, with these stickers affixed to allow for sale. IMAGE: The Joshua Tree various T-Shirts. The tour and general merchandising produced a number of other items which we pictures above and below, taken from an old merchandising flyer from Propaganda magazine. The T-Shirts above include the “Joshua Tour White Tee” (A), “Joshua Tour Black Tee” (B), “Joshua Tree” (E) and “Bullet White Tee” (H). The Bullet the Blue Sky T-shirt has to be one of our choices for ugliest t-shirt that U2 has produced, featuring a screaming person with a background of red in front of an army jeep with the words “…I can see those fighter planes” on the front of the shirt. On the back is the familiar U2 logo, the name of the song and a skeletal body. IMAGE: The Joshua Tree various merchandise. 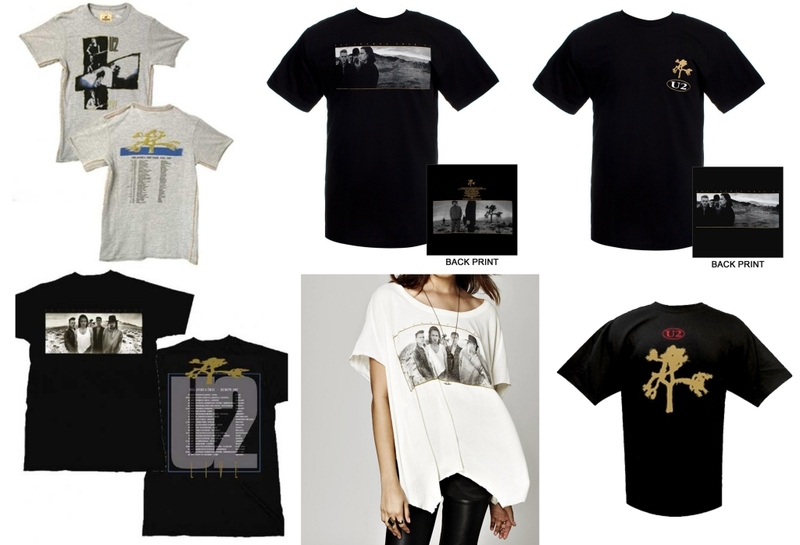 Some of the other merchandise produced in this period include a black cap with the U2 logo (O), tour posters in colour and black and white (Q, R), a postcard set (S) featuring five postcards including the cover for The Joshua Tree, an “Artcard” set featuring four images of the band and the U2 logo in the bottom corner in red and black, a Joshua Tree patch (V) and a larger Harmony motel card poster (U). Some of these items such as the patch and the hat as well as the tour program were sold at tour stops. Others were sold just through U2s fan magazine, Propaganda. The T-shirts pictured here are not the only T-shirts produced for the tour and merchandising, and there are a number of additional shirts produced for that time frame for promotional use as well. IMAGE: The Joshua Tree duvet cover. One of the more interesting pieces we’ve discovered over the years is a single duvet cover and pillow case. 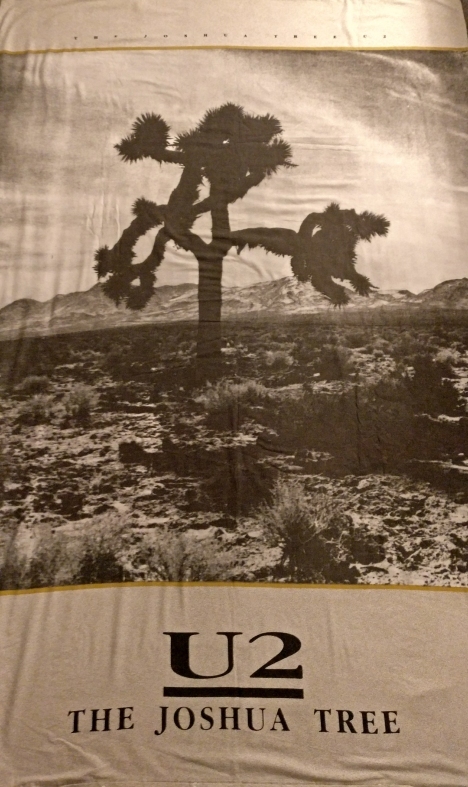 The duvet cover features The Joshua Tree on both sides inside a golden frame, with “U2 – The Joshua Tree” displayed at the bottom and “The Joshua Tree U2” at the top. 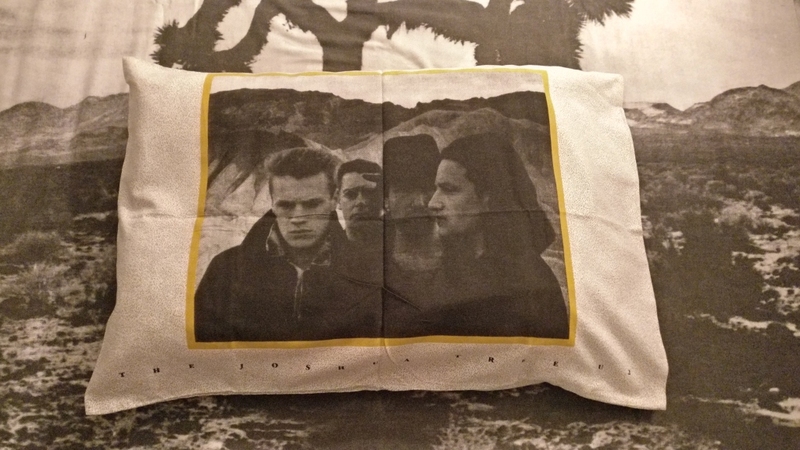 The pillow case features a picture of the band on both sides, shot on location of The Joshua Tree cover. The manufacturer of the set, Bianca from Portugal, no longer exists. The set was sold at department stores in the UK and Ireland. We do know that the set is official, or at least endorsed by the band, as the set that ended up in our collection was a raffle prize in a school in Dublin, and the set was donated directly by U2’s management. As well Steve Averill has confirmed that he was involved in the design of those bed sets. IMAGE: The Joshua Tree pillow case. This pillow may be the perfect thing to help you dream beneath a desert sky. We do not believe they were ever sold separate from the duvet cover itself and thus you would need to buy the set to get the pillow cases. The original raffle prize was given away in 1988 – 1989 (we aren’t sure of the exact date) so the sheets date from the late 1980s. In 2009, U2 fans began to notice a bunch of products appearing online and in stores, not just items branded for the No Line on the Horizon album, and the U2360 tour, but a variety of materials promoting earlier albums. The items are all branded Live Nation Merchandise, and are dated 2009 in most cases. U2 had signed a new deal with Live Nation in March of 2008, and it appears that Live Nation was quick to get some U2 merchandise on store shelves. 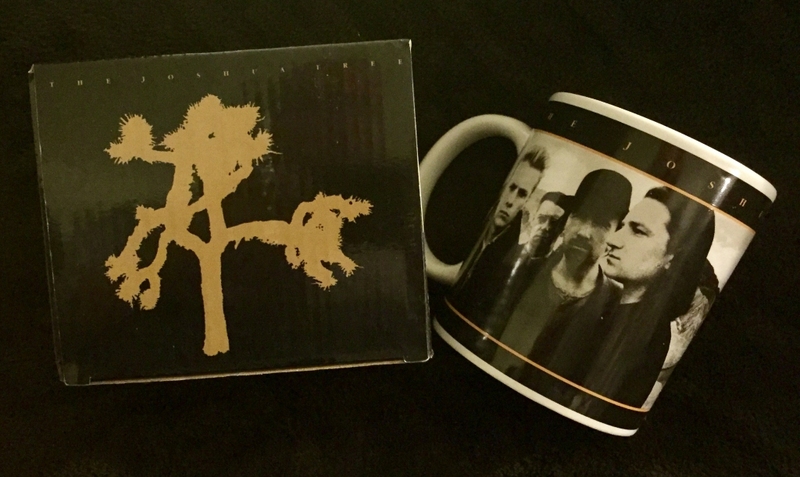 IMAGE: The Joshua Tree mug and box. Among these collectibles, was a set of four coffee mugs produced by Rock Off / Kiwi Publishing made in China. Rock off made four mugs, including one for The Joshua Tree as well as mugs featuring the covers of War, Under a Blood Red Sky and Rattle and Hum. A fifth mug features U2 in black and white on one side, and the wings logo on the other side. Each mug was sold in a lovely little cardboard box decorated on five sides with pictures of the band, logos and the like. The sixth side of the box is left open so the mug is displayed. Rock Off produced a number of mugs featuring other artists as well including The Beatles, Madonna and Pink Floyd. The U2 mugs were often sold in store displays featuring multiple artists. IMAGE: The Joshua Tree fridge magnet. A set of four fridge magnets was also produced by Live Nation Merchandise (76mm x 76mm square), featuring the same four albums as the mugs. Live Nation also produced a set of hats, both beanies and baseball caps, but there was no Joshua Tree items in the hat selection. Live Nation also produced a U2 Greeting card, featuring the cover of the same four albums used in the mugs and magnets. The greeting cards were 160mm x 160mm. A set of four square buttons, also produced by Live Nation, featured The Joshua Tree, War, Rattle and Hum and the blocky U2 logo used for the No Line on the Horizon album. IMAGE: The Joshua Tree lunch box. A metal lunch box featuring artwork from The Joshua Tree was also produced by a company called Vandor and was dated 2010. 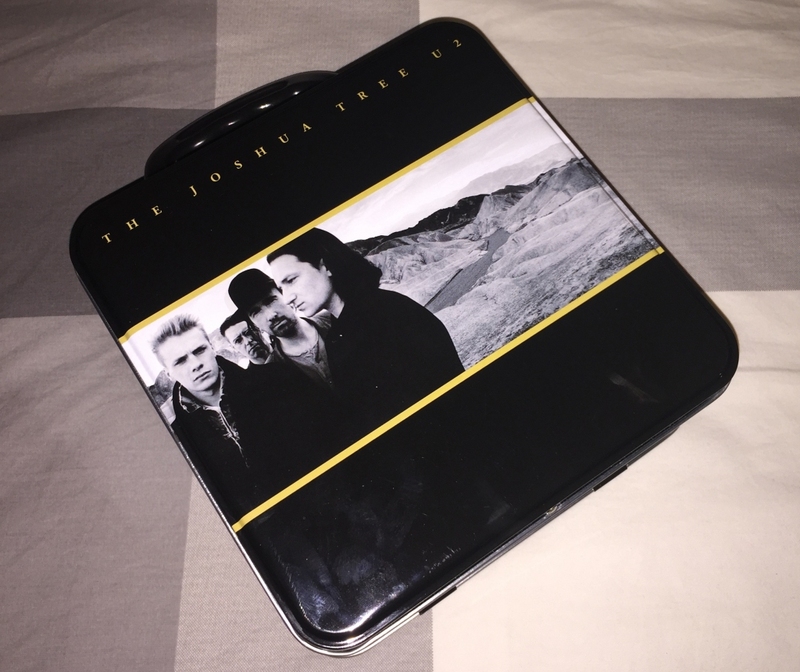 The square lunch box features a square shape, with rounded corners, and the image of The Joshua Tree on the front, wrapping around on to the sides of the opening. The box has a black plastic handle, but is otherwise made of metal. The box was 18cm x 24cm and 7.6cm deep. U2.com has been featuring a bunch of vintage t-shirts over the years including a number of “The Joshua Tree” designs. Not all of these are replicas of earlier shirts, in fact a number of the designs were new. The first one pictured above is a “vintage childrens shirt” which is a replica of an earlier shirt. The second is an album T-Shirt with the track listing on the back of the shirt. The third one is another album shirt, with a small Joshua tree on the front of the shirt. The fourth shirt is a tour shirt featuring original dates but newly printed for U2.com. The fifth shirt is a replica of an earlier shirt design but in a far different style. The sixth shirt pictured above, black with the tree logo, is a replica of an earlier shirt pictured above, but does not have the back print that the original shirt did. The launch of the new tour back in January saw the store launch a number of new shirts, some of which are pictured below and are still available for purchase if you would like to get a new shirt before you head off for The Joshua Tree Tour 2017 this summer. We see similarities to some of the earlier 1987 shirts, but there are definite differences in most of these shirts from those original designs. As the tour starts, and the merchandise stands open I’m sure we will have even more merchandise to add to the growing list of items produced to promote The Joshua Tree and The Joshua Tree Tour including a nice new box set just announced this morning.